As the last option, you can also create a database table on the basis of metadata (both internal and external). 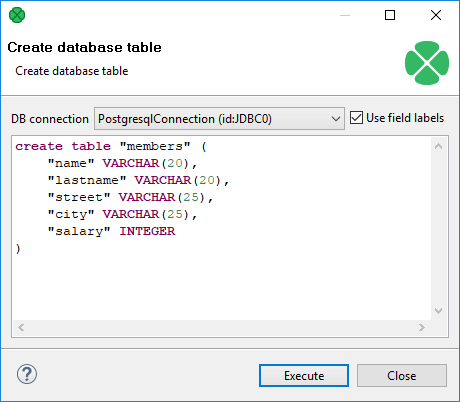 When you select the Create database table item from each of the two context menus (called out from the Outline pane and/or Graph Editor), a wizard opens with an SQL query that can create database table. You can edit the contents of this window if you want. When you select some connection to a database. For more details, see Database Connections. Such database table will be created. If multiple SQL types are listed, actual syntax depends on particular metadata (size for fixed-length field, length, scale, etc. ).